The Men's and Women's Doubles competitions both began on the second day of the 2016 ITTF World Tour Hybiome Austrian Open, Thursday 10th December, as pairings from across the globe set out on their hunt for silverware in the city of Linz. One comeback victory took centre stage in the Men’s Doubles category with Korea Republic’s Kim Minhyeok and Park Ganghyeon pulling off arguably the biggest recovery of the day at the Open. Kim Minhyeok and Park Ganghyeon are well versed in each other’s play having combined to win a Men’s Doubles silver medal on the ITTF World Tour as recently as the 2016 Czech Open in September, but the Korean duo were forced to really dig in against France’s Romain Lorentz and Joe Seyfried as the two partnerships went head-to-head in a tight encounter at the 2016 Austrian Open. The opening two games produced agonisingly close scorelines as Lorentz and Seyfried edged into a two-nil lead, however, Kim and Park managed to overcome their disappointing start by claiming three consecutive games to achieve a dramatic three-two victory (10-12, 13-15, 11-9, 16-14, 11-5) sealing their place in the next round. Another fascinating five game encounter was played out between Czech duo Tomas Konecny and Dimitrij Prokopkov against Mexico’s Marcos Madrid and Salvador Uribe; Madrid and Uribe led two-one after the opening three games had panned out, but tensions began to rise as their Czech opponents managed to steal game four to shift the momentum in their favour heading into the deciding game. However, it was the Mexican team of Madrid and Uribe who eventually prevailed, narrowly taking the final end and the overall win. Three more matches ended up finishing three-two as Hungary’s Tamas Lakatos and Adam Szudi, Poland’s Marek Badowski and Konrad Kulpa, and the African partnership of Nigeria’s Quadri Aruna and Egypt’s Omar Assar all advanced from the preliminary round. 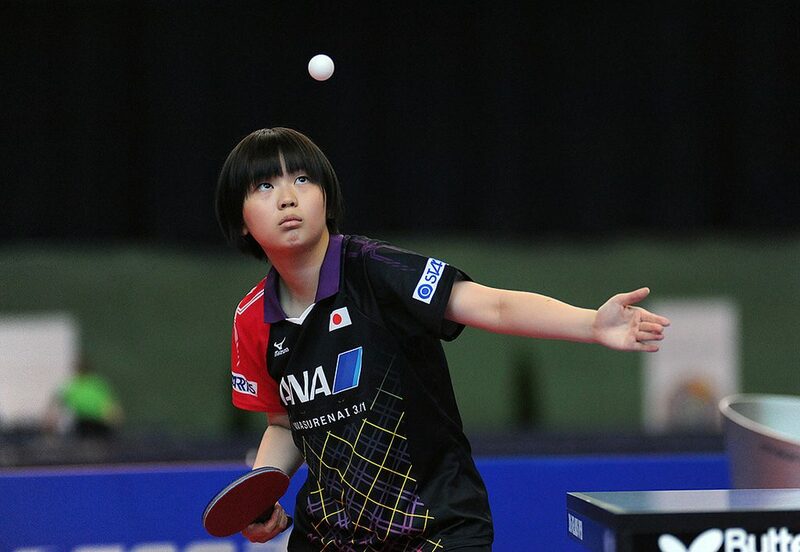 The spectacle of the Women’s Doubles event saw Japan’s Saki Shibata and Maki Shiomi edge out Hsiung Nai-I and Lin Chia-Chih of Chinese Taipei in the only match to go to the fifth game in the round. Shibata and Shiomi took an early lead in the tie going one-nil ahead after a dominant showing in game one, but all of a sudden Hsiung and her partner Lin found their feet in the match claiming back-to-back games reversing the lead in their favour. Both doubles pairings were well aware as to the importance of securing the fourth end with a potential game win for Hsiung and Lin being enough to bring the tie to a close, but a spirited Shibata and Shiomi kept up the fight and the successful capture of two games in a row saw the Japanese pair triumph (11-3, 9-11, 10-12, 11-8, 11-3). Japan had one other doubles team taking part in the round as Hina Hayata and Miyu Kato raced to a three-nil victory against Croatia’s Ida Jazbec and Mateja Jeger. Shan Xiaona and Kristin Silbereisen have safely won their opening Women’s Doubles match as the German partners recovered from a game down to defeat Emina Hadziahmetovic of Bosnia Herzegovina and Serbia’s Anelia Lupulesku in four games, but unfortunately for the Austrian home spectators Karoline Mischek and Amelie Solja weren’t able to progress beyond Singapore’s Lin Ye and Zeng Jian.